Maria Leijerstam became the first person in the world to cycle from the Antarctic coast to the South Pole in December of 2013. 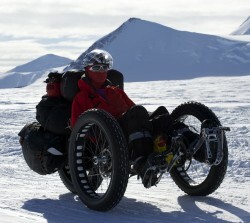 She rode a custom, 3-wheeled polar cycle on the Antarctic Traverse covering 400 miles in 10 days 14 hours and 56 minutes, setting a new speed record. Maria produced a documentary about the expedition called The White Ice Cycle and you can learn more about it her website whiteicecycle.com. Maria Leijerstam, welcome to The Pursuit Zone.